BLUES (28) COUNTRY, FOLK (17), FUNK, JAZZ, LATIN (30), REGGAE, ROCK, SKA (11), SWING. Originally a custom library employing Sonar�s MIDI Groove Clip �enhanced SMF� format that contains best-of material from the Twiddly.Bits guitar collections Electric & Acoustic Guitar, Jazz Solo Instruments, and The Funk, plus a range of brand new material. 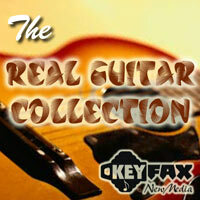 Fresh loops are focused on rock (strums, solos, and lines), and Latin styles, and comprise around 20% of this collection, so owners of all three of the above-mentioned titles may not feel there�s enough new material to justify the purchase.